If you are a fan of spaceships and strategy games, I may have some awesome news for you. Infinium Strike, the strategy action hybrid from Codex Worlds, previous members of Ubisoft, will come to PlayStation 4 in Q3 2016 in addition to the previously announced Xbox One release. The Kickstarter-funded PC version, published by 1C Company, will release on Steam for Windows, Mac and Linux on July 14, 2016. So what is Infinium Strike? Set hundreds of years in the future, humans are on the brink of extinction after decades of intergalactic colonization. The Wrog, a race of sentient alien ships, will stop at nothing until mankind is eradicated. All hope appeared lost until the discovery of a liquid metal known as Infinium. 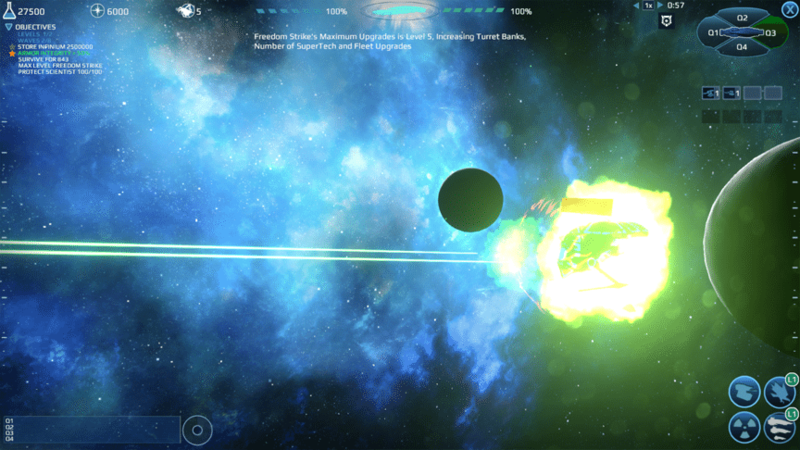 Harnessing the power of Infinium, humanity has built Freedom Strike, the strongest battlecarrier in the universe. Turrets – Employ eight types of automatically firing weapons, each with its own advantages and disadvantages for particular classes of enemy ships. Building or upgrading turrets requires Infinium. Fleets of battleships – Send a swarm of heavily armed spaceships to attack the Wrog. Deploying battleships requires fleet points, which are accumulated over time. SuperTech – The most powerful weapon in a player’s arsenal, SuperTech can do everything from increasing resources collected from destroyed Wrog to attacking every ship in a quadrant. SuperTech has a 90-second cooldown. Essentially, it’s a space-based tower defense style game. Looks good to boot too. Infinium Strike offers two game modes. In campaign mode, players advance through 10 missions in their quest to defeat the Wrog. Deep Space serves as an endless arcade mode in which players test their skills against endless waves of Wrog. Each player receives the same enemy attack patterns in Deep Space, allowing gamers to battle for the top spot on the leaderboards. Previous articleLooking for a job in the video games industry? Psyonix may have a spot for you!